What is the Biggest Danger? Here’s a trick question: what is the biggest danger to your long-term investment results? If you answered something like “market downturns” or “downside volatility,” you’re not only missing a bigger danger, you may be missing the way investment markets work. 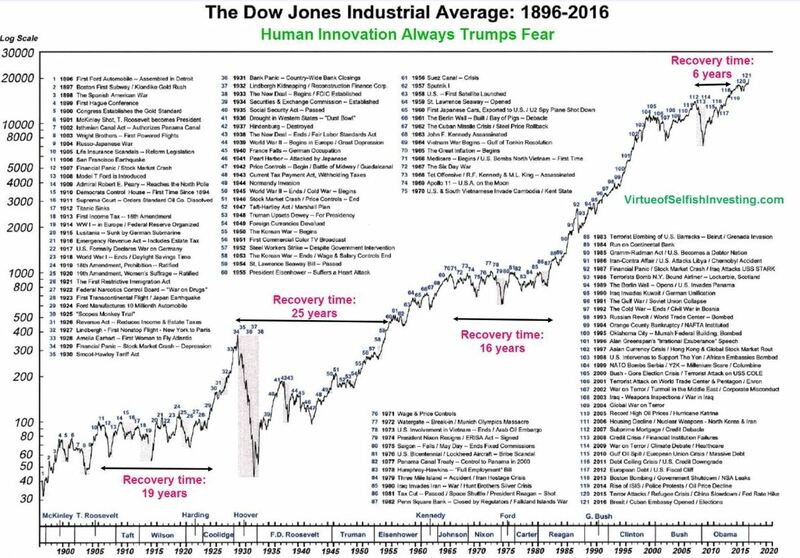 As you can see from the chart below, there have been a lot of market setbacks since 1896, and yet the overall trajectory of the market (as you undoubtedly already knew) has been a fairly steady rise. The longest recovery times in modern history—25 years during the Great Depression, 16 years during the stagflation period of the 1970s—are also the only times when someone with a time horizon of more than 10 years would have seen a loss after hanging tight for the full decade. The recovery time from the severe downturn in the Great Recession was just 6 years. So what’s a bigger danger than something awful like the Great Recession? Investment experts talk about a human failing called “policy abandonment,” which is a fancy way of saying that the investor bailed on the markets, generally at the wrong time. Suffering a significant decline in the Great Recession was temporarily painful, but what about the people who abandoned their portfolio allocations and retreated to cash at or near the bottom, because they just got too nervous about what the market would do the next day or the day after? They locked in those losses, moved to the sidelines and found themselves with permanent—rather than temporary—portfolio losses. The lesson of the chart as its author, Chris Kacher, points out, is that the stock market is long-term driven by the intelligence, creativity, innovation and hard work that people working in various companies put into their jobs every day. The value of companies tends to rise, but fear sometimes makes people sell their stock at lower prices which, up to now, have always recovered to reflect that growing value. The recent turmoil in the markets is certainly unsettling, but it’s nothing compared with the Great Recession, the Great Depression—or, probably, the next significant bear market, whenever it comes. That next downturn will present us with the illusion of danger (a temporary market decline) and some will take the opportunity to embrace real danger—the danger of “policy abandonment” that makes temporary losses permanent. The year 2018 ushered in seismic tax-code changes that you’re likely to see reflected on your 2018 return: notably, the end of personal exemptions as well as higher standard deduction amounts that mean many fewer taxpayers are apt to benefit from itemizing their deductions than in the past. As 2019 dawns, the changes to the tax code are far less remarkable–more evolutionary than revolutionary. Most of the changes amount to tweaks that reflect the effects of inflation in various provisions within the tax code. Standard Deduction: Standard deduction amounts are increasing slightly in 2019 to $12,200 for individuals and $24,400 for married couples filing jointly. AMT-Exempt Amounts: The exemption amounts for the alternative minimum tax are increasing slightly in 2019 to $71,700 for single filers and $111,700 for married couples filing jointly. The full exemptions are available to taxpayers with alternative minimum taxable incomes of less than $510,300 (single filers)/$1,020,600 (married couples filing jointly). Qualified Dividend and Long-Term Capital Gains Rates: Three rates are still in place for dividends and long-term capital gains–0%, 15% and 20%–but they don’t map perfectly by tax bracket as they did in the past. Here are the parameters for each of the rates. 0%: Single taxpayers with incomes between $0 and $39,375; married couples filing jointly with incomes between $0 and $78,750. 15%: Single taxpayers with incomes between $39,375 and $434,550; married couples filing jointly with incomes between $78,750 and $488,850. 20%: Single taxpayers with incomes over $434,550; married couples filing jointly with incomes over $488,850. Income limits for deductible IRA contribution, single filers covered by a retirement plan at work: Modified adjusted gross income under $64,000–fully deductible contribution; between $64,000 and $74,000–partially deductible contribution; more than $74,000–contribution not deductible. Income limits for deductible IRA contribution, married couples filing jointly, if the spouse making the contribution is covered by a retirement plan at work: Modified adjusted gross income under $103,000–fully deductible contribution; between $103,000 and $123,000–partially deductible contribution; more than $123,000–contribution not deductible. Income limits for deductible IRA contributions, married couples filing jointly, if the spouse making the contribution isn’t covered by a retirement plan at work but his/her spouse is: Modified adjusted gross income under $193,000–fully deductible contribution; between $193,000 and $203,000–partially deductible contribution; more than $203,000–contribution not deductible. Income limits for Roth IRA contribution, single filers: Modified adjusted gross income under $122,000–full Roth contribution; between $122,000 and $137,000–partial Roth contribution; more than $137,000–no Roth contribution. Income limits for Roth IRA contribution, married couples filing jointly: Modified adjusted gross income under $193,000–full Roth contribution; between $193,000 and $203,000–partial Roth contribution; more than $203,000–no Roth contribution. Total 401(k) contribution limits, including employer (pretax, Roth, after-tax) and employee contributions and forfeitures: $56,000 if under age 50; $62,000 if 50-plus. Saver’s Tax Credit, income limit, single filers: $32,000. Saver’s Tax Credit, income limit, married couples filing jointly: $64,000. The Internal Revenue Service recently announced the official estate and gift tax limits for 2019: The estate and gift tax exemption is $11.4 million per individual, up from $11.18 million in 2018. That means an individual can leave $11.4 million to heirs and pay no federal estate or gift tax, while a married couple will be able to shield $22.8 million. The annual gift exclusion amount remains the same at $15,000. For the ultra-rich, these numbers represent planning opportunities. For everybody else, they serve as a reminder: Even if you don’t have a taxable estate, you still need an estate plan. The Trump tax cuts slashed the number of estates subject to the federal estate tax, by doubling the exemption amount from a base level of $5 million per person. So, there were only an estimated 1,890 taxable estates in 2018 (according to the Tax Policy Center). That compares with 4,687 taxable estates in 2013 reflecting a base $5 million exemption, and 52,000 taxable estates in 2000 when the exemption was $675,000. What about the $15,000 annual exclusion amount? You can give away $15,000 to as many individuals as you’d like. A husband and wife can each make $15,000 gifts. So, a couple could make $15,000 gifts to each of their four grandchildren, for a total of $120,000. Lifetime gifts beyond the annual exclusion amount count towards the $11.4 million combined estate/gift tax exemption. Warning: The $22.8 million number per couple isn’t automatic. An unlimited marital deduction allows you to leave all or part of your assets to your surviving spouse free of federal estate tax. But to use your late spouse’s unused exemption – a move called “portability”—you must elect it on the estate tax return of the first spouse to die, even when no tax is due. The problem is if you don’t know what portability is and how to elect it, you could be hit with a surprise federal estate tax bill. And note, if you live in one of the 17 states or the District of Columbia that levy separate estate and/or inheritance taxes, there’s even more at stake, with death taxes sometimes starting at the first dollar of an estate. (Note: California does not levy separate inheritance taxes.) Several states were in line to match the federal exemption amount for 2018, but state legislators determined the new doubled exemption was just too high.